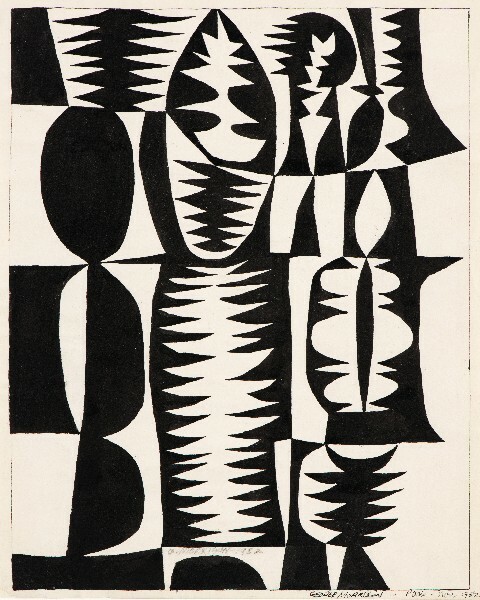 Black and White Patterened Forms.Work on paper, 1952. 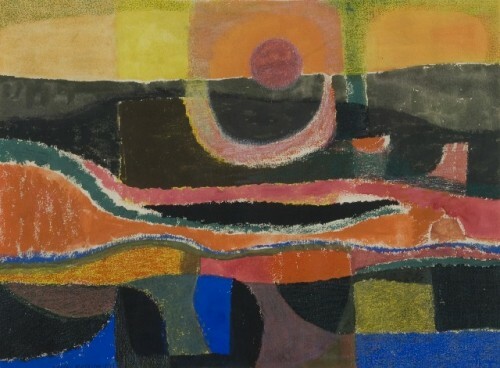 Sun and River, 1949, watercolor and crayon. 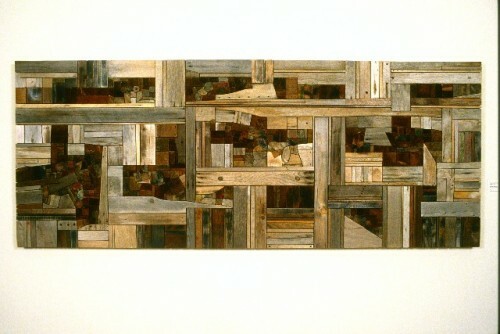 Cumulated Landscape, 1976, wood. Minnesota Museum of American Art. 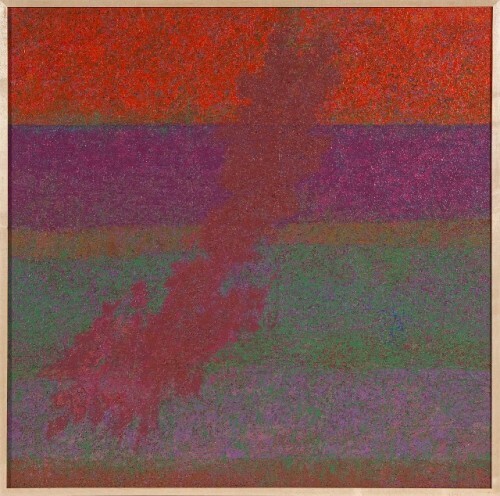 Untitled (Lake Superior Landscape), 1986, MMAA..
Red Totem. Stained cedar. 1980, Heard Museum. The abstract artist George Morrison (1919-2000) in terms of art history and identity politics is an enigma. He was an integral part of the mainstream avant-garde of the New York school and running mate with the abstract expressionists. There are few overt signifiers in his lyrical, meticulously crafted paintings, drawings, prints and reliefs in wood of his Native American heritage. Although he enjoyed critical success including respectful reviews, prestigious teaching positions, museum level exhibitions and acquisitions, he has been denied a well-earned position in the canon of Post War American modernism. Because of the purity of an abstract vision only after achieving mid-career success was he accepted within the community of Native American artists. Based entirely on aesthetics Modern Spirit: The Art of George Morrison, a five venue traveling exhibition would be appropriate to the museums and institutions that supported the work during his lifetime. A short list might have been The Walker Arts Center in Minneapolis, Art Institute of Chicago, New York’s Whitney Museum of American Art which exhibited and bought his work, Rhode Island School of Design, where he taught for a number of years, or the Provincetown Art Association and Museum and Cape Ann Museum where he summered. This is not meant to detract from the Native American themed museums that have joined forces to celebrate an artist who made his mark in the art world. Morrison served as a role model for creators seeking an unfettered pursuit of their own inner vision and style. He defined a new possibility. To paraphrase Morrison when pressed on the identity of his work; I am a Native American artist so what I create is Native American Art. It is a point of view enforced by the art historian and curator, W. Jackson Rushing, III, who provided us with an insightful tour of the exhibition. Most of the dialogue revolved around the artists, theories and movements that the superbly sophisticated artist immersed himself in while living and working in New York, France, Provincetown and a range of teaching gigs and fellowships. The artist was well read and traveled widely. He absorbed the zeitgeist of studios and bars during the era that Irving Sandler has defined as the Triumph of American Art. There was a lively sense of connoisseurship as we discussed works with their range of accents derived from automatic surrealism, frottage, hints of Arp, Miro, Dubuffet, Davis, Guston, Kline, Nevelson, or action painting. There was an analogy to a wine tasting which Rushing confirmed by commenting that Morrison had a refined taste for wine, women and song. He loved jazz and the chunky, eccentric improvisations of Thelonius Monk were a particular inspiration. At the age of ten he suffered severe hip pain that caused him to leave the Hayward Indian School in Wisconsin where he was a boarding student. He underwent surgery to treat tuberculosis of his left hip. That meant 14 months in a hospital including eight months with both legs in casts. To pass the time there was a diverse library and an abundance of art materials. Other surgeries followed and Morrison would suffer from other forms of illness through his life including chronic heart disease and eventually cancer. The long period of childhood confinement led to a shy and introverted personality. He is described as a man of few words who walked with a limp. This is also an insight to the oeuvre which is contemplative, precise, and formalist. There is a sure and deliberate well thought through approach to his art practice. This prevails even at its most spontaneous in the spirit of automatic surrealism and action painting. While initially creating as a form of distraction and recreation during long stretches of convalescence his natural talent was quickly recognized and encouraged.By twelve he was making souvenirs to sell to tourists.After high school he enrolled in the Minneapolis School of Art. The training was primarily conservative in the academic regionalist tradition reflected in some of his surviving early work in the exhibition. In 1941 he was exposed to Picasso in an exhibition at the Minneapolis Museum of Art. Having won awards and a scholarship in 1943 he bought a one way ticket to New York to enroll in the Art Students League. From that point he never looked back. He occasionally visited family in Grand Portage (Lake Superior) Band of Chippewa in northern Minnesota. He returned to live the rest of his life in 1970 starting with a one year then permanent appointment at the University of Minnesota in Minneapolis. He was a studio artist in the newly formed American Indian Studies Department. This entailed research for a new course Arts of the American Indian. 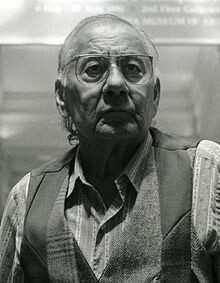 Inspired by this challenge he and his second wife Hazel Belvo became members of the activist American Indian Movement (A.I.M.). In treating the life and work of a complex artist like Morrison there are essentially two approaches. Some critics, curators and art historian have taken the formalist approach of only discussing the work in its own terms. There is a sense of pride in not mentioning the heritage of the artist as a part of the critical discourse. Much of the writing about Morrison attempts to unearth and discuss the Indian resources of the work and how that pertains to the larger discussion of contemporary Native American Art. It’s the old game or conundrum of naming is knowing. Perhaps a confluence of formalism, ars gratia artis, and identity/ heritage discourse is a plausible entry level to rich and complex work. Indeed the full range of all of these factors are at play in coming to grips with the oeuvre. The horizon line, which appears in the 1940s, is a signifier or logo for Morrison. It is not always there among many ideas and experiments in the work. The landscape becomes more consistent as an idea after a return to his Chippewa land and heritage. Illness in the last decades of his life caused him to work on an endless and much coveted series of small landscapes. These intimate works abound with inventions of color and the textures of paint. One thinks of the series paintings of Monet and their multiple variations and inventions. For a time as an art student Morrison worked in a frame shop. In the small paintings as well as some exquisitely concise wood collages the framing is an integral part of the work. Typically he surrounded the work with an edge of silver leaf and then an outer perimeter of natural wood of the same width. It is simple and elegant in the manner in which it enhances the paintings. The rightness of this approach is underscored in the wrongness of a piece from the series which was reframed in a shadow box. The painting seems to have lost its soul. There are many wonderful works or series that warrant more attention than the limits of this review. While in Provincetown the artist and his friends gathered drift wood along the beach. From this found, weathered material he created horizontal relief compositions with individual slices as tesserae in mosaic like reliefs. They were an immediate sensation and he received a number of commissions from collectors and corporations. One owned by the Amon Carter Museum, which broadly supported his work, is described as one of the most admired works in the collection. That was confirmed in a letter to the artist from the director. In this direction he may have been inspired by his friend Louise Nevelson who also exhibited at Grand Central Moderns. They swapped works and her piece is illustrated in the catalogue. As demand for the sensual and stunning relief works continued Morrison used sculpted elements cut out of exotic species of wood. In 1977, Evan M. Maurer, the curator of The Native Amerian Heritage: A Survey of North American Indian Art commissioned a work for the exhibition. 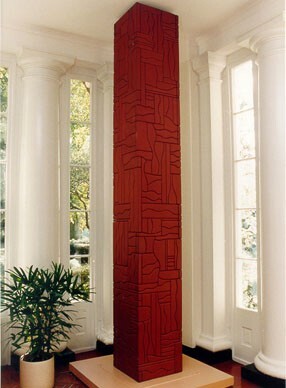 The resultant Red Totem I (144 x 15 x 15 inches) was its centerpiece at the Art Institute of Chicago. This initiated a series of masterpieces exploring the totemic theme. Typically Morrison extensively researched the tradition of spiritual monoliths over many millennia in global cultures. Drawings of specific objects with his notations are included in the exhibition. These large, free standing wood appliqued works are more deliberate in design and pattern than the initial pieces from found materials. They are stained with a color called Indian Red. The significance of that resonated with the artist and surely reflects an effort to conflate with Native heritage on his own terms. The exhibition includes the Heard’s Red Totem (1980, stained cedar). Wow. 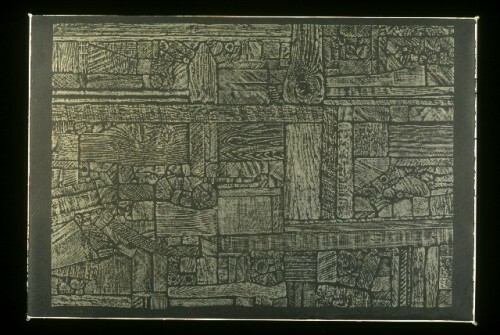 In addition to wood reliefs and sculpture he also produced wood cut prints and rubbings. Again these works on paper are much prized by collectors. Morrison could be playful as well as intensively inventive and obsessive. From the post card invitations for exhibitions including those of his friends he added colored papers to create vertical collages. He borrowed images of other artists to expand them as his own witty works. The show includes Red Rock Variation A Memory for Franz Kline Fragment. The artist, who died young, was a close friend of the artist and godfather of his son Briand. Intricate, horror vacui drawings such as Untitled 1977, a meticulous ink on paper work, are absorbing and fascinating. The artist stated that he started in a corner and through an endless number of equally spaced, curved and patterned parallel lines eventually filled the space. In its all over patterning there is no obvious manner to approach or amble through this visual labyrinth. The work evokes similar approaches by Mark Tobey and Bruce Conner. It is unlikely that Morrison knew of their work although he conforms to an esoteric tradition of shamanism and spiritualism. During our discussion Rushing was most animated in endorsing the landscape which comprise his primary focus after returning to his roots in 1970. The exquisite Lake Superior Landscape (1981) occupies pride of place as we enter the exhibition which after this introduction is hung chronologically. Another work in which he takes particular interest is Witch Tree (1981) inspired by a sacred cedar tree growing at the edge of Lake Superior that is said to be 300 years old. In a range of mutations it appears in a number of abstracted works. For me this richly beautiful and sensual exhibition is the beginning of wanting to know more about the artist. In particular I asked Rushing about the Provincetown connections which began in the summer of 1945. Was he around and a participant in the formative dialogues of Forum ’49? Did he know its organizer Weldon Kees and did they share an interest in jazz? Off and on Morrison continued to be connected to Provincetown with its intensive seasonal dialogues about cutting edge American art. By e mail with Chris Busa, publisher of Provincetown Arts Magazine, he confirmed that Morrison was a friend of his artist father, Peter. Particularly when they both taught in Minnesota. Chris informed me that he owns several Morrisons through exchange. One suspects that there are other works by Morrison in P’Town collections. It’s a stimulus for further research and exhibitions. This wonderful exhibition hopefully will provide the artist with wider recognition. There is, however, a very real concern that by being presented in the context of Native American Art, it will remain under the radar of the mainstream art world with its elitist critics and curators. As Miles would say, In a Silent Way, Morrison dedicated his life and work to breaking through barriers. His art and heritage belong to all and not just some of us. "Charles, Morrison was an artist of the moment he absorbed the energy that was around him and as you pointed out he went where that energy existed. Still the question persists is he stifled by his acknowledged heritage because of latent racism in the art world."